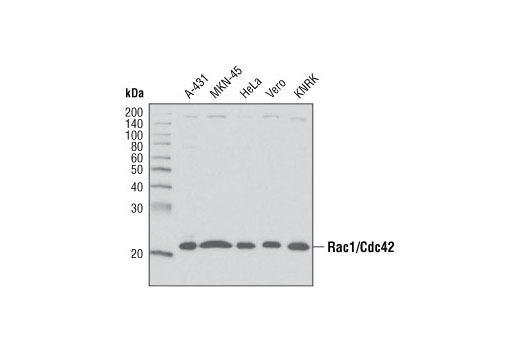 Rac1/Cdc42 Antibody recognizes endogenous levels of total rac1 and cdc42 protein. Based on sequence similarities, the antibody may react with other small GTPases. Polyclonal antibodies are produced by immunizing animals with a synthetic peptide corresponding to residues near the amino termini of human rac1 and cdc42. Antibodies are purified using protein A and peptide affinity chromatography.